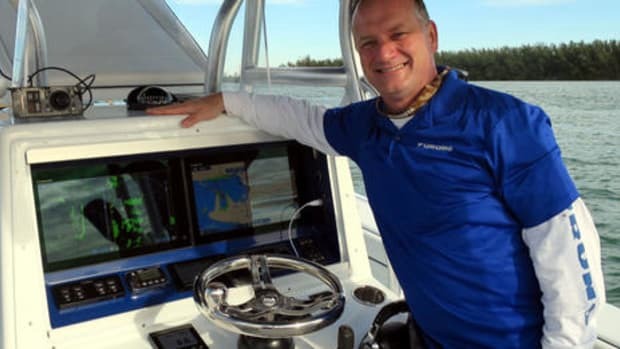 The multiple layers of Garmin wireless communications going on above may seem crazy, but they all work well and have endless practical and/or fun applications around a boat. 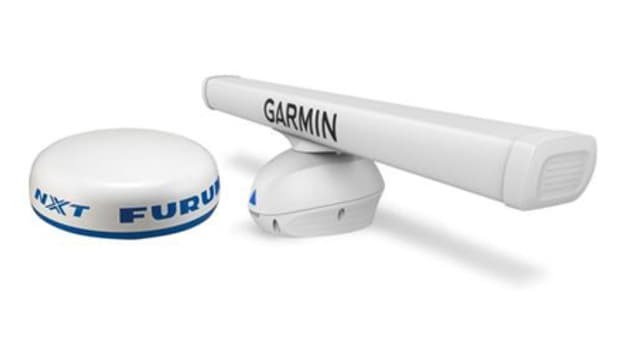 The multiple layers of Garmin wireless communications going on above may seem crazy, but they all work well and have endless practical and/or fun applications around a boat. Normally, for instance, it would take two people to align a fixed boat camera, plus running power and video cables. 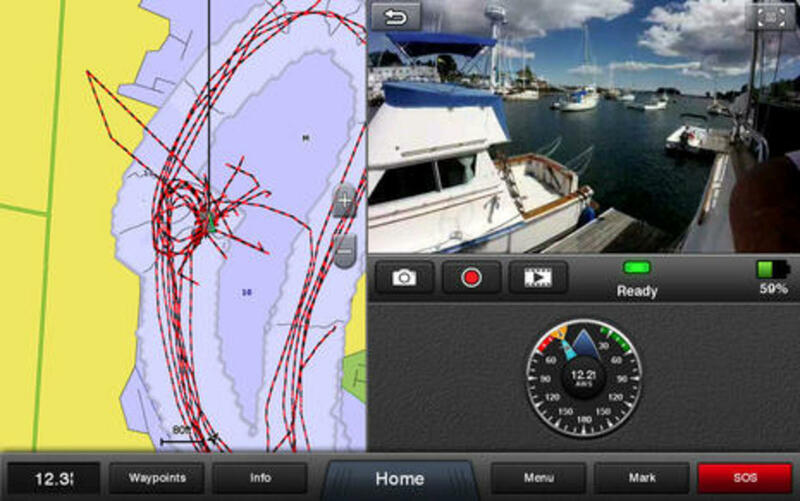 But I simply climbed up Gizmo&apos;s mast, mounted a Virb XE with an adhesive base, and aligned it using the free Garmin Helm app on my phone to see the Virb video screen running on the flybridge GPSmap 7612. It took mere minutes to get a masthead view at my helm, and while mounting the gWind sensor required tools, it too is completely wireless. Garmin is blazing several worthy wireless trails. But wait, stop the presses! 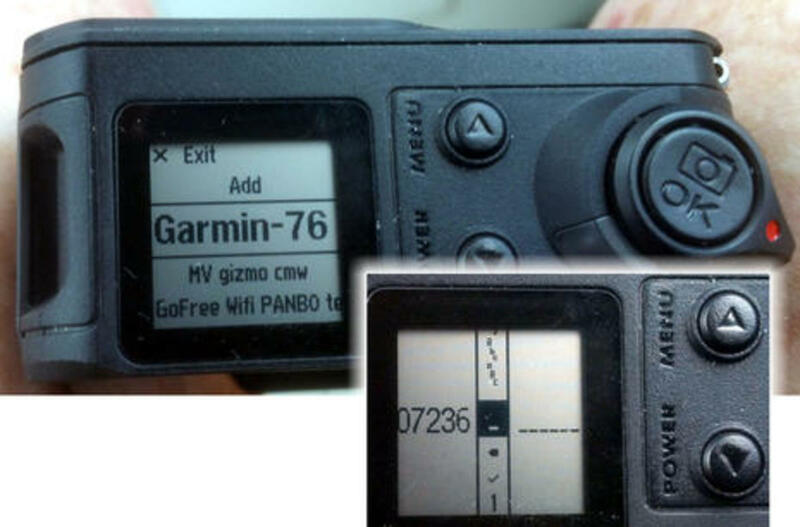 I had nearly finished an entry about how the Virb XE, gWind Wireless 2, and Quatix 3 watch have all integrated wonderfully with the Garmin nav system on Gizmo when to my surprise Garmin announced the new Virb Ultra 30. 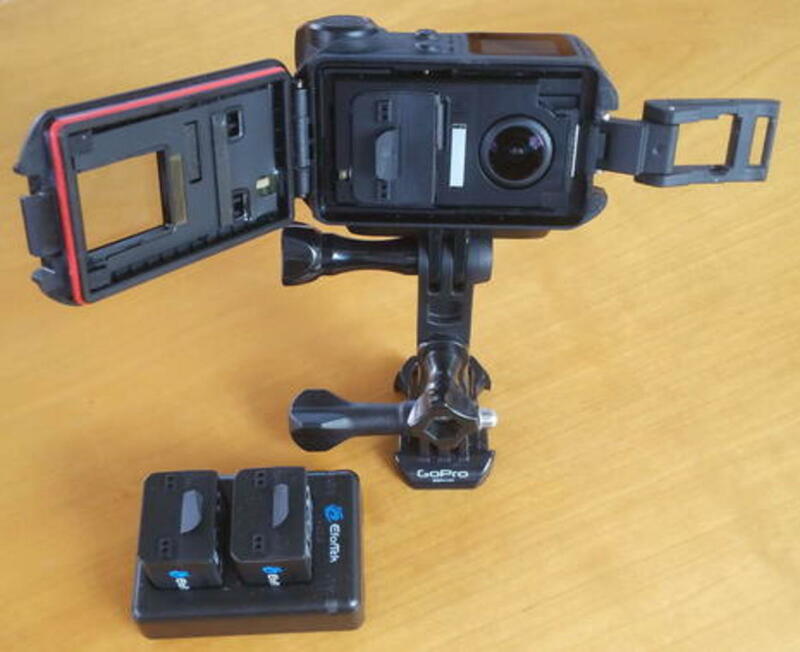 And the Ultra looks like it will make an even more spectacular boat camera! So the other gear will wait until entry #2. Below is my hands-on experience boating with the Virb XE before I learned about the Ultra this afternoon, and then a bit on how the Ultra seems to compare. 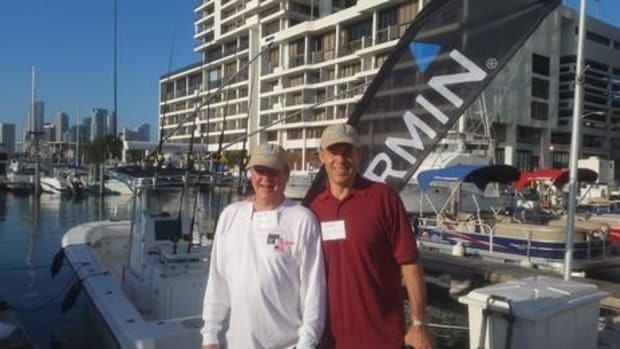 I think that the really big Garmin wireless deal is how well the second generation Virb X and XE "action camera" design can integrate with the latest Garmin marine displays, even though it surely doesn&apos;t look like a fixed boat cam, and it is still mainly marketed toward crazed young men wearing helmets. Of course, you can still take the Virb any time you decide to jump off a cliff, but I contend that it makes one heck of a versatile and affordable boat cam no matter the "action" level. 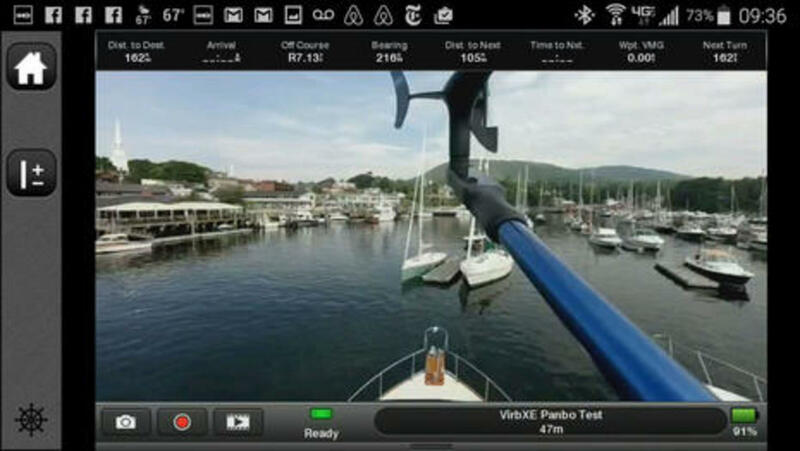 I&apos;m about to dig deep into the MFD/Virb integration, but note that you can still use a Virb X/XE fairly well as a fixed boat cam without a compatible Garmin MFD thanks to the excellent Virb phone and tablet apps. Actually, I quite enjoyed testing the first generation Virb cams even without WiFi-connected display and control, and the totally redesigned X and XE models are easier to use standalone. They are also waterproof to 50 meters, as evidenced above by the well gasketed and clamped housing door that protects the battery and SD card. Note, too, how the Virb mount system easily mixes with third party components -- including the premium ScanStrut Rokk Mini gear I recently tested -- and there&apos;s also plenty of battery competition. Now here we see how the test Virb XE works once it has joined the WiFi network of an MFD like the GPSMap 7612. It&apos;s functioning like a fixed boat cam with its wide-angle lens monitoring an area I can&apos;t see well from the helm. That particular bimini tube mount might be useful backing into a slip, but the Virb could be semi-fixed anywhere around the boat, or you could move it from mount to mount as needed. Or, in fact, that screen could purportedly be set up to show four simultaneous Virb video streams -- or some mix of Virb, analog, and Axis IP network cams -- and each window could be made full screen with two taps. 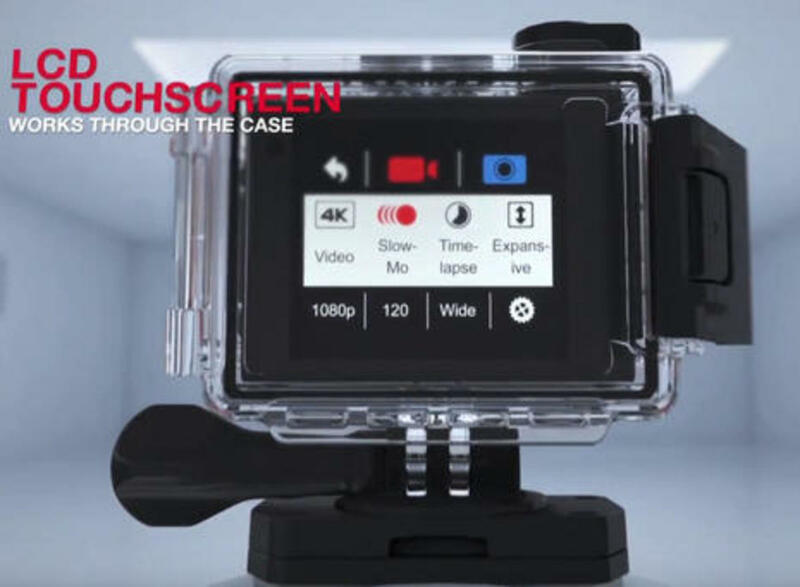 But only the Virb video window will have those menu bar buttons that let you take a snapshot, start a video recording, or even review the photos and clips already saved in the camera, and that&apos;s just the first layer of cam control. I should add here that the Virb battery will only provide a couple of hours of continuous video streaming, though Garmin does offer a Rugged 10M Power Cable that converts 10-30 volts DC and maintains the camera&apos;s waterproof integrity, and you&apos;ll see that the MFD Virb app has a sleep function. 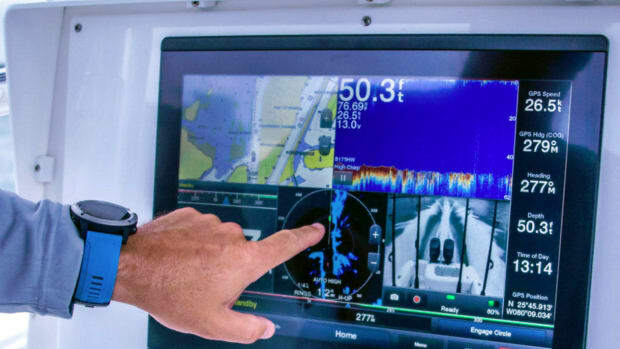 The Virb also lacks the near range night vision typically included in good boat cams like the Raymarine CAM200IP discussed here on Panbo, and Ray also supports snapshots and video recording. 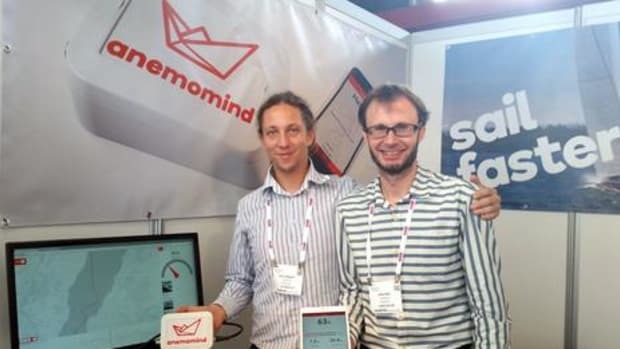 But, then again, if you like the idea of a boat monitoring cam that can also take creative videos, I don&apos;t think there is another MFD camera control as deep. Here the Virb is mounted aft under Gizmo&apos;s extended cabin top and I&apos;m looking at it via the 7612 and the iPad version of the Garmin Helm app. Note the main VIRB Menu available on the MFD -- you&apos;ll see powerful Video Setup submenu below -- and also that the Helm app itself can record the MFD screen stream. At least theoretically then you can record the camera stream to your phone or tablet and quickly show it off via email or social media, though I found the results a bit choppy (there&apos;s a lot of WiFi going on here). Note that I could have used the camera&apos;s direct controls to put it in WiFi access point mode and then run the Virb iOS app. I&apos;d get the same control functionality plus some edit features and smoother operation. 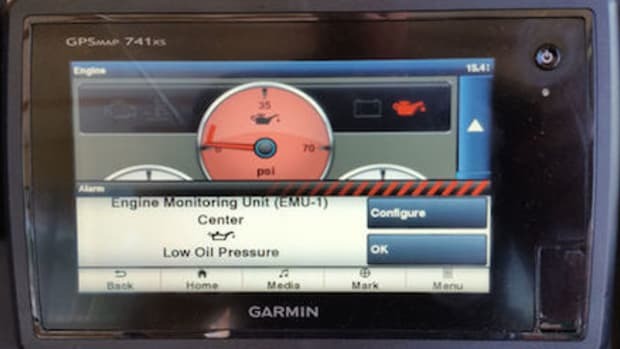 It&apos;s also true that most any current MFD with a camera attached can be monitored elsewhere on a boat because all the big brands offer free screen mirroring apps. 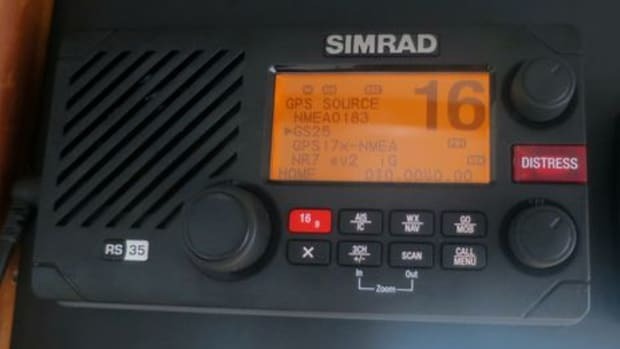 That&apos;s particularly important because analog cameras don&apos;t normally network around a boat MFD system like radar, sonar, and charts do (that&apos;s also true of the Virb and the 7612, though the Garmin 8400/8600 series MFDs seem able to network any kind of camera). Yes, I know this all sounds complicated, but I&apos;m trying to explain all the possibilities while most boaters will only use a few. As I wrote after some experience with this same gear (and more) during the April Garmin demos, please don&apos;t freak out! 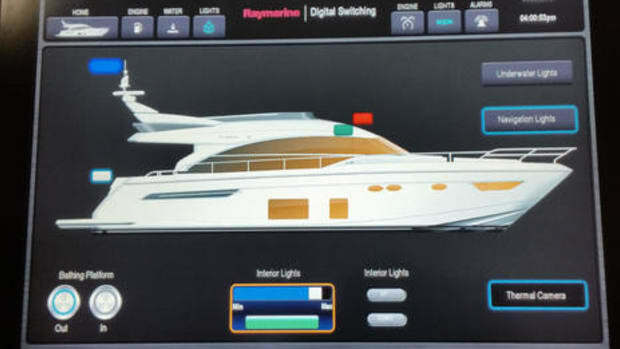 In this screen I&apos;m up at the 7612 MFD on the flybridge with the Virb monitoring the main cabin -- which might be especially valuable once we get the grandkids cruising -- and you can see how deep the Video Setup menu is. 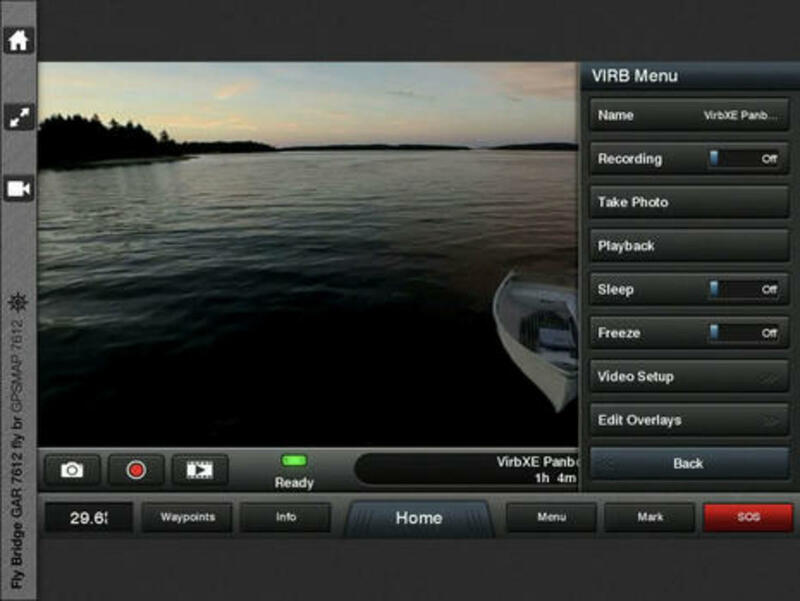 I can put the Virb in Slo Mo or Time Lapse modes, switch among its three Field of View choices and much more. In fact, I&apos;m thinking that a masthead time lapse of the Camden Windjammer Festival boat traffic seen from my mooring might be a keeper. I also plan to use the Virb for some troubleshooting, like trying to locate exactly where Gizmo&apos;s hydraulic steering rams are weeping when underway. 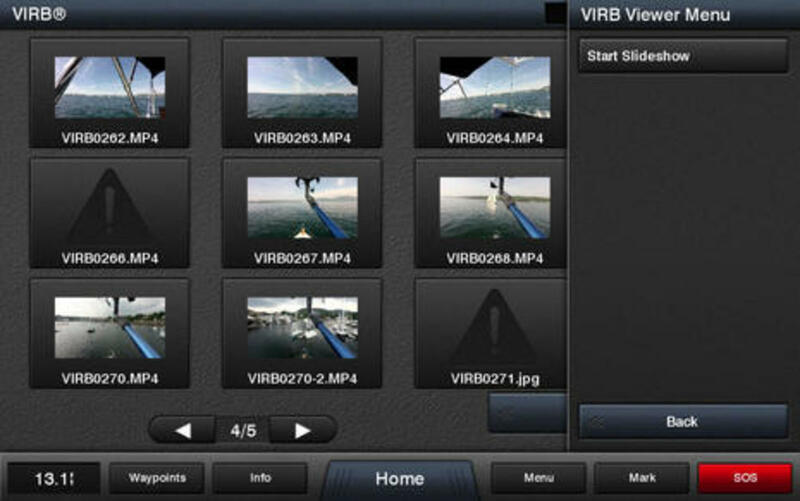 It&apos;s neat that the marine interface to the Virb lets you review stills and videos, and even run a slideshow. In my experience creating the thumbnail images and then playing video clips was a little poky, but the high bright 12-inch display certainly beats out the iPad and the phone for daytime viewing, and Garmin MFDs go much bigger these days. Consider, for instance, a seriously fished center console and how fun it would be to review the action immediately. 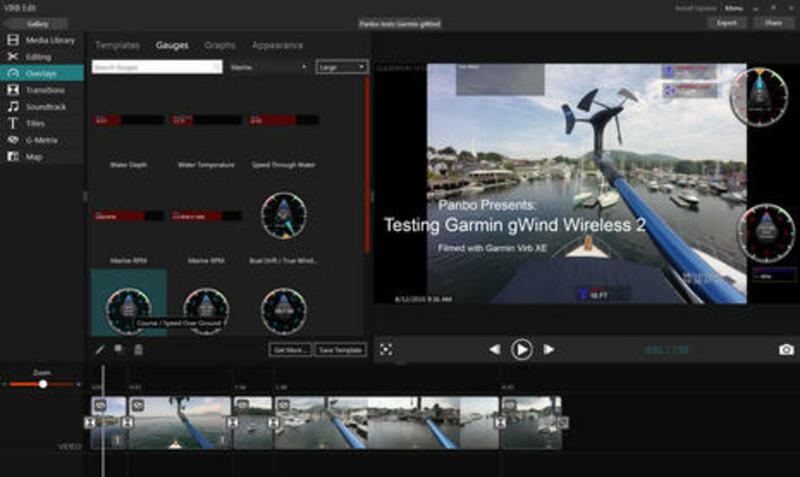 Sailors have much to gain from Virb technology too, and this Garmin video illustrates the giant G-Metrix feature I haven&apos;t mentioned yet . 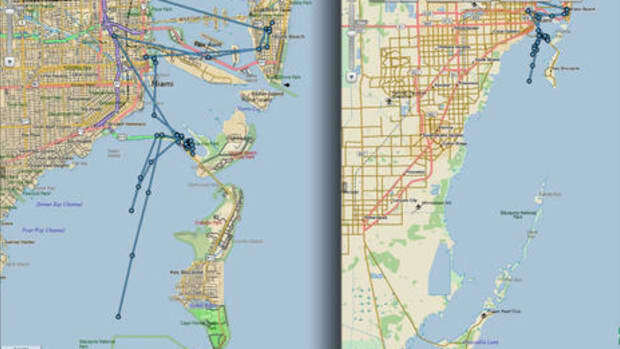 I, too, have made good use of the Virb&apos;s ability to collect relevant data on its own and from the boat, and then to overlay it on videos, as in the recent Camden grounding entry. But actually creating a video from your raw clips requires video editing and that scares some people, including me. Again Garmin has largely redesigned their action camera, but I sense that the Virb Ultra 30 is a home run in their stated effort to dominate the markets they play in. Admittedly the company does not consider Virb to be especially boaty -- that&apos;s why the sole "water sports" marketing representative (who probably should be wearing a helmet) is a windsurfing at 26 knots, and also why boating media like me didn&apos;t get the word. But that&apos;s also why I&apos;ve been making a big deal of the Virb series all along, and my colleagues in the much larger action sports world (who have actually had Ultras to test) are all thumbs up. But can the Ultra fit into a Garmin navigation network like the XE? The "Compatible Devices" list here pretty much says YES (and I&apos;m hoping that the 7612 is just an inadvertent omission). The perfect boat power cable is not yet listed as an accessory, but I do know that the marine division is quite aware of the Virb&apos;s value in their segment, and I&apos;m confident that the necessary accessories will happen. And need I add (see image above) that the Ultra will eliminate hassles like signing into an MFD&apos;s WiFi network. In fact, the Ultra can apparently operate thru an independent WiFi network, possibly like your boat&apos;s router, which is a useful capability that Garmin marine equipment has not yet adopted. And in that same vein, how about the Ultra&apos;s voice interface? If Garmin has made that work decently with a tiny camera, will it be the first to let us verbally command our MFD? But would you want to? The Virb X, XE, and Ultra 30 currently have suggested retail prices of $300, $400, and $500, though you can surely pay less. They will all do the boat and phone/tablet integration described above, but I think that the XE is minimal mainly due to its image stabilization, another feature not yet mentioned. However, if you&apos;re only going to have just one Virb on the boat, and to unclip it for other adventures or whatever, the new Ultra 30 sure looks like the way to go. Even the product video below is a cut above, and do check out all the other Ultra 30 videos Garmin posted today.